The DT-361 High-Intensity LED Stroboscope is a velocity analyzing and measuring device that is ideal for machinery process inspection. The DT-361s LED technology extends operation due to the low energy requirement of the light diodes. 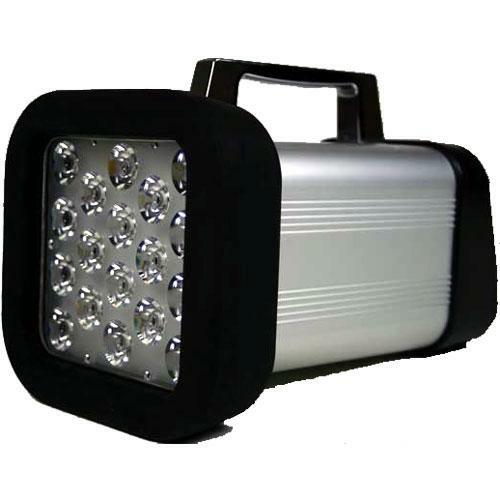 The light output (Lux) of the LED array is far brighter than xenon powered stroboscopes. The simple to use keypad plus rate adjustment dial aids in making quick changes of the flash rate to coincide with changes in the speed of your process. The dial allows fine-tune altering of the flash rate while the x2/÷2 keys enable large spanning over the entire flash range. The DT-361 has the added feature of modifying the flash duration or on time which aids in picture clarity often necessary in printing processes. The phase shift function is ideal for rotating equipment where the user needs to change the focus on different blades, gears, or section of the machinery. 6000 FPM & 3.6° (100 µs): Distance 8" (20 cm) 18,400 lx with 10" (250 mm) irradiation dia., Distance 20" (50 cm) 6200 lx with 13.5" (350 mm) irradiation dia. Typically 50,000 hours. Varies depending on usage. Articulating swing arm for DT-360 series stroboscopes. Heavy duty construction with internal springs for improved strength. Surface mount swivel bracket for mounting to horizontal surface sold separately. The Shimpo CABLE-361-10FT is a 10-foot long daisy chain cable for Shimpo dt-361 and dt-365 stroboscopes. The Shimpo CONN-SET361 is an input and output connector for the Shimpo DT-361 and DT-365 stroboscopes.